Most people receive a dish garden as a gift. They are lovely when they arrive, because they’re usually made of three or more houseplants with contrasting foliage colors and textures. 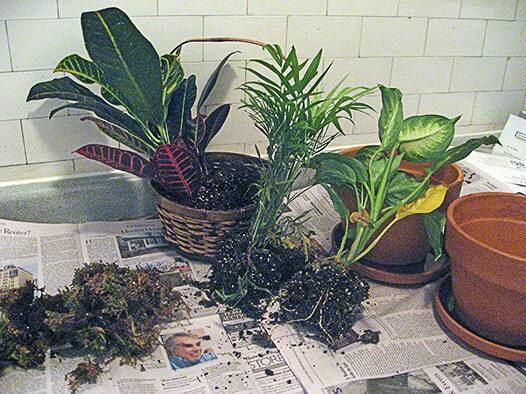 Most are in a low dish or basket, and are dressed up with moss to hid the soil. Dish gardens aren’t intended to be long-term plantings, however. Having so many plants crammed into a shallow bowl doesn’t leave much room for the roots. If you have a dish garden that you’ve enjoyed for awhile, you might be wondering how to care for it long term. Think of dish gardens as a college apartment where several students are crammed into a small space to save money on the rent: being so crowded is doable for awhile, but it’s not a situation that can go on forever. Eventually, in the interest of future growth, everyone must move on. So it is with the plants in dish gardens…after a few months, it’s time for each of them to move up to private housing. Start by removing the moss that decorated the top. This isn’t necessary, and in fact it frequently prevents people from accurately judging if the plant is too wet or too dry, so begin by tossing it in the compost. Next, tip all the plants out of the container and one by one, separate each from the roommates. You can do this most easily, and with the least damage to the plants, by holding on to the base of the plant and pulling the roots away from the others. Pot each plant on its own in a new pot. Fill the entire pot with soil – no rocks or broken pot pieces in the bottom. Don’t cover the drainage hole, not even with a paper towel. Just new, moistened potting soil and the plant. Be sure to leave about an inch of space between the top of the pot and the top of the soil so that you can water it easily without the water running all over the place. (If the plant is too big to allow such a space, find a taller pot.) Water the plants well and let the excess water drain out of the hole, pouring out any that collects in the saucer underneath. Let your plants recover for two or three weeks before you start fertilizing. Once they start to grow again you can begin to feed them according to the directions on the package of fertilizer you’ve chosen. A new life for old dish garden plants? You Can Grow That! Here are the plants pulled apart from each other. I think that they are already rejoicing that new digs are at hand!